Tell me, you who desire to be subject to the law, will you not listen to the law? For it is written that Abraham had two sons, one by a slave woman and the other by a free woman. One, the child of the slave, was born according to the flesh; the other, the child of the free woman, was born through the promise. Now this is an allegory: these women are two covenants. One woman, in fact, is Hagar, from Mount Sinai, bearing children for slavery. Now Hagar is Mount Sinai in Arabia and corresponds to the present Jerusalem, for she is in slavery with her children. But the other woman corresponds to the Jerusalem above; she is free, and she is our mother. For it is written, ‘Rejoice, you childless one, you who bear no children, burst into song and shout, you who endure no birth pangs; for the children of the desolate woman are more numerous than the children of the one who is married.’ Now you, my friends, are children of the promise, like Isaac. But just as at that time the child who was born according to the flesh persecuted the child who was born according to the Spirit, so it is now also. But what does the scripture say? ‘Drive out the slave and her child; for the child of the slave will not share the inheritance with the child of the free woman.’ So then, friends, we are children, not of the slave but of the free woman. We are in the forgiveness business. The divisive nature of our times takes things to the extremes. We tear down before we know the whole story, and we think because we see it with our own eyes, we ASSUME that what we are seeing is what is. In reality it is a skewed perception of a slanted reality pitched in such a way to get an outcome that is far from the truth. Too far from the truth. God help us all. Horrible, I know. KIDS THESE DAYS! It is so easy to cry out when we see this static, un-nuanced image. 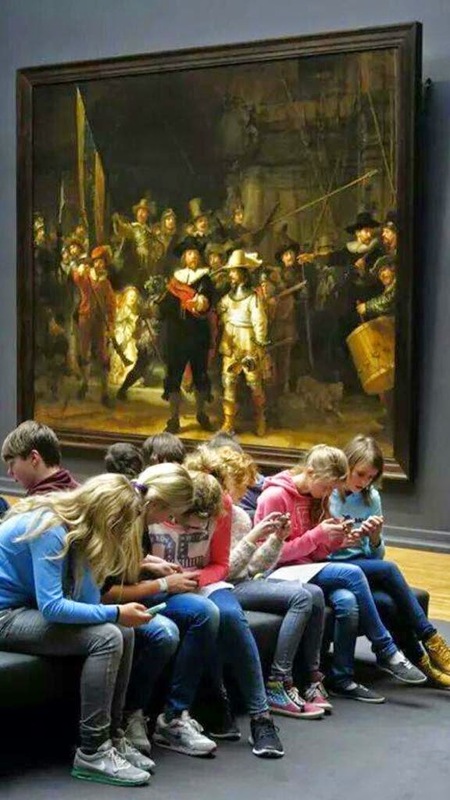 But these kids are in an art class they chose to be in, and they are using their technology to learn on an interactive app set up by the Rijksmuseum to teach youth about the painter and his paintings. In fact, they are doing exactly what we would want them to do. They are guilty of being obedient. But that is not what our eyes tell us! I know. We judge. We jump to conclusions. We beg grace, but so quickly we jump back to law. That is what Paul talks about this morning, living by law or embracing Grace. We cannot do both. And it is what Jesus talks about this morning, that yeast of the Pharisees. Too often we miss the point, and then miss that we miss the point. It is what we need to talk about, especially in these days. Black and White. All or Nothing. Life or Death. Guilty or Pure. We have lost the patience to seek the truth. We have lost the patience to find a middle way. I mourn for us, and what we have become. Both those on the Right or Left, Red or Blue. However one colors it. Now I can think of several headlines recently that jumped to conclusions, in nanoseconds. Lives are destroyed in the name of righteousness. Maybe that is what needs to happen, but I urge myself to take a breath, to learn all I can, before I jump to a conclusion, before I take the bait. If I err on the side of love and grace, I will not err. Even if we have to make hard decisions, at least we can do it with patience and love. It is how Christ treated folks. Even the churchy, judgy ones who condemned him to death. And when we have been changed, like the man’s whose blindness was healed, we must go somewhere else. Ask anybody who works with addicts, if we go home to old systems and patterns we will fall into the old ways, almost guaranteed. The healed man received the advice: ‘Do not even go into the village.’ Maybe we, too, need to heed that advice. God help us. God forgive us. Amen.